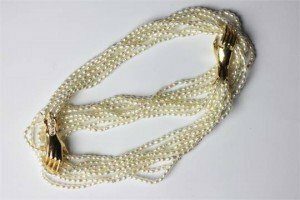 An 18ct gold fresh water pearl necklace, the eight strand choker necklace with a hinged clasp formed as two gold hands with diamond set detailing, stamped 750. 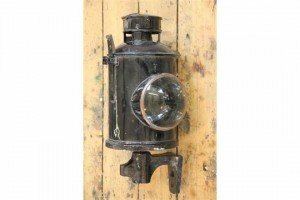 A vintage painted metal and brass Railway oil lamp, of circular form with hinged cover enclosing reservoir and burner. 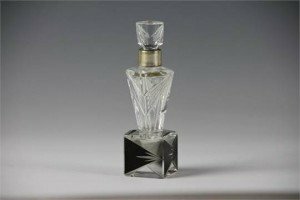 An Art Deco perfume bottle and stopper, the cubic base with black enamelled triangular detail, supporting the high shouldered bottle, with conforming cut glass detail. 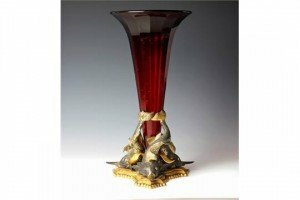 A 19th century continental table centre, with a fluted ruby glass trumpet vase supported on a tri-form gilt brass base cast with three stylised fish. 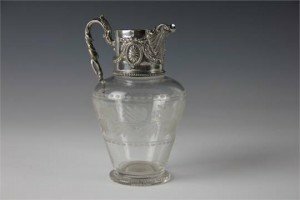 A Victorian silver plate mounted glass jug, with garland and acanthus scroll detail and shell moulded spout, engraved floral detail to the glass body. 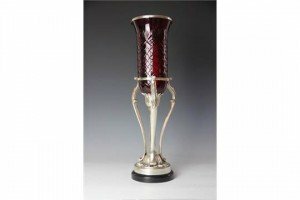 A modern Indian white metal and ruby glass storm candlestick, supported on a fluted column and circular base. 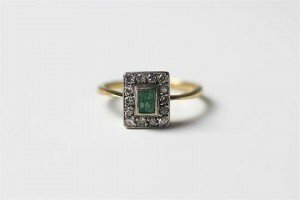 An emerald and diamond Art Deco style ring, the central emerald surrounded by fourteen rose cut diamonds. 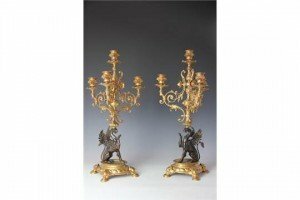 A pair of late 19th century bronze and gilt brass candelabra, each modelled with three foliate sconce arms cast with dolphins and a central sconce, supported on a bronze griffon and oval base with dolphin mask feet. 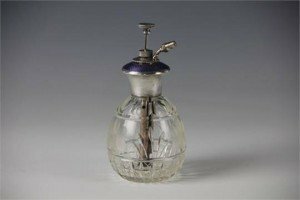 A sterling silver perfume atomiser, circa 1920 with lavender guilloche enamel detail and faceted glass base. 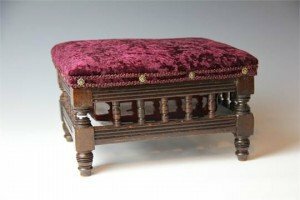 A Victorian stained beech foot warming stool, the galleried stool with hinged lid enclosing original treacle glazed pottery foot warmer. 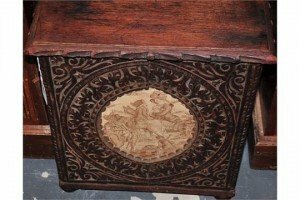 A long carved wood Victorian panelled log box or storage box. Carved with cherubs and foliate swags at sides and having printed central panel at front. 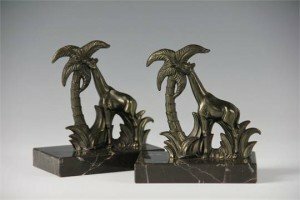 A pair of bronze effect giraffe statues, each modelled as a giraffe aside a palm tree, and raised on variegated marble bases. 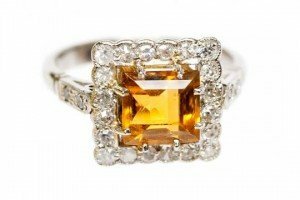 A citrine and diamond cocktail ring, platinum shank, square step cut citrine surrounded by brilliant cut diamonds and diamond chips to the shoulders. 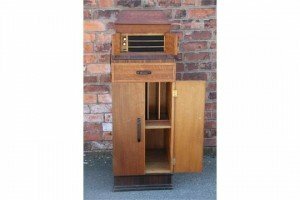 A His Master Voice oak and Macassar ebony Art Deco gramophone, with Garrard turn table, two doors over a drawer and two larger cupboard doors. 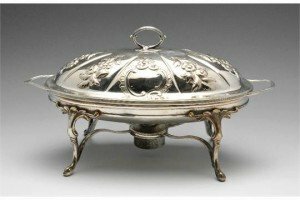 A George III silver entree dish and cover, the oval form with reeded rim and twin handles and later floral embossing, raised on a plated stand with foliate supports and central burner. Hallmarked London 1796. 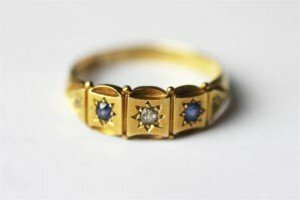 An Edwardian sapphire and diamond five stone diamond ring, Birmingham 1908, the 18ct yellow gold ring set with two sapphires and three diamonds. 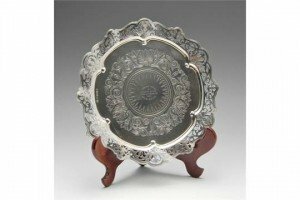 A mid-Victorian silver salver of shaped circular form with foliate scroll pierced rim enclosing a similarly engraved border with personal presentation inscription to the centre, the whole raised on three scroll pierced feet, hallmarked Sheffield 1858. 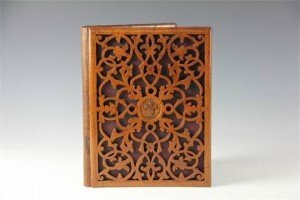 A Victorian oak blotter pad, the leather folio with oak front carved in gothic strap work design, and with central Prince of Wales feathers. 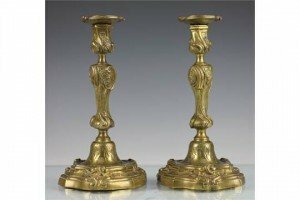 A pair of late 18th century French Neo-Rococo candlesticks, cast throughout with C scroll flowers and insects on serpentine bases. 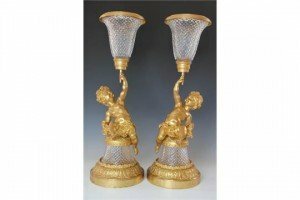 A large pair of Empire style gilt brass figural vases, each moulded glass vase supported by a Bacchante putto, on an anthemion cast circular base.